When an estranged family hires a cult deprogrammer to kidnap back their son from a murderous cult. They think this job will be easy in getting their child back. Hiding in a remote cabin in the wilderness, they quickly discover that the cult doesn't want to let him go. The family finds themselves under siege when the cult ends up returning and surrounding their cabin and plans on killing the family to retrieve their member. The first time I heard about Jackals was over on the Shockwaves Podcast when they had the writer of the film on to talk about the movie. A few of the hosts had gushed about how dark and violent Jackals was, and it got me excited to see this story. I've always been a fan of cult based movies. Cults have always fascinated and interested me. I like knowing how they tick. Add the whole home invasion element, and you've peaked my interest in this one. I now had to see this flick. A few months after listening to the podcast. I finally got to see Jackals. On the first viewing of the movie, I didn't enjoy it. It wasn't a bad movie by any means. On the contrary, it's very well made. The film was incredibly mean-spirited. It was so much so that it turned me off. The movie was just a downer. While I enjoy a nihilistic and bleak story as much as the next horror fanatic. I must not have been into it on that particular day. It really didn't sit well with me. So rewatching Jackals again so I could review it for the blog. I didn't mind it on the second viewing. I knew exactly what I was in for and for the most part, I can really appreciate what they tried to do with it. This is not a film that you watch and enjoy. This a harrowing story. It's brutal, and there is no relief here. This movie goes from one to one hundred in a matter of minutes and at times, its pretty bloody disturbing. For that, I can admire what they turned in with Jackals. The first element that I liked was the family dynamic. From those opening moments that I saw the family that was estranged and torn apart, I wanted to see this family survive what was eventually coming. I also wanted to watch our cult deprogrammer get through to their wayward son. I had hoped that he would be able to successfully save him. I wanted to see this family become one again. I wished for their grief and despair to be over and done with. That comes down to the writing of the characters early on in the story. Sadly, that was not to be for this family. This is where the movie lost me. Once the cult shows up and starts to descend on the cabin. This is two generations of people being preyed upon and wiped off the map. Instead of giving the audience some sort of chance to see a family at least get one up on the cult. It never does come to this family. While they manage to kill a few of the cult members, it isn't enough. I really wanted to see some retribution. This is not that movie, though. Jackals is one brutal little movie. While some of the creepy cult members are killed off. It's nothing in comparison to how much the family end up suffering in the story. Silly character decisions aside, this family is put through the wringer. This family is horrifically tortured. One scene involves a character being strung up to a swing set and set on fire. Another character has her throat slashed when she tries to reason with the cult. It's just one horrible act of violence after another and all I wanted to see some relief for these people. The acting in the film is great. The biggest name is Stephen Dorff, and while he was on screen, I enjoyed his performance as a tough cult deprogrammer. I was shocked by what they did with his character. It's both Johnathon Schaech, and Deborah Kara Unger who play the parents here and I enjoyed both of their performances. There is something about Deborah Kara Unger who is so alluring to watch on screen. She has this almost sombre and spaced out way with her acting. It's always very intriguing to witness her act in a movie. Lastly, I wanted to bring up another issue that I had with the story. Sometimes, I do enjoy not knowing the backstory of a character. It makes it more creepy or intense. In The Strangers, it's scary knowing that the only reason they are murdering these people was that they were home that night. We knew nothing about the killers. It's the same with the cult here. Yet, this time around, I wanted to get some exposition on why this cult was so ingrained in this son character. I wanted to know more and not knowing that while making this bleak, I felt like it lacked on the story. - A man's hands are set on fire. - A cult member is killed and thrown over a banister. - A woman has her throat slashed. - A man's stomach is slashed open. - Someone is repeatedly stabbed in the stomach. - A man is repeatedly stabbed in the back and stomach. - A cult member is stabbed in the stomach with a pickaxe. - A man is stabbed in the stomach. - A teenage girl is strangled to death. - A man bites down on his tongue and spits out blood. - A cult members head is bashed in with a hammer and candlestick. - A cult member is choked to death. - A man's tattoo is carved off. 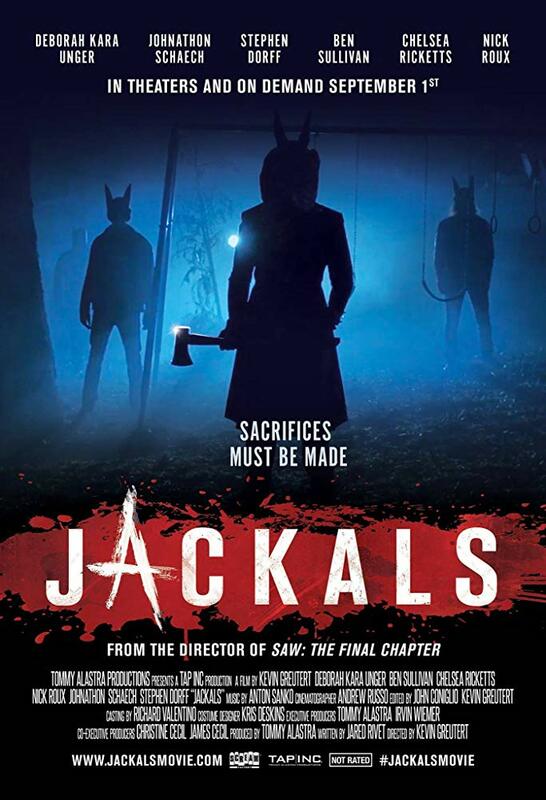 Jackals is a mean-spirited, cruel, and violent cult horror movie that meets the home invasion story. If you want an experience that you'll have fun with, you will need to look elsewhere. This is not the movie for you. If you want a dark, bleak, bloody, and harrowing film about a family being murdered by a cult, get ready as Jackals will put you through your paces. You will come out of this story emotionally drained. This will continually gut-punch you. While the movie has it's fair share of problems, I think it still needs to be witnessed.